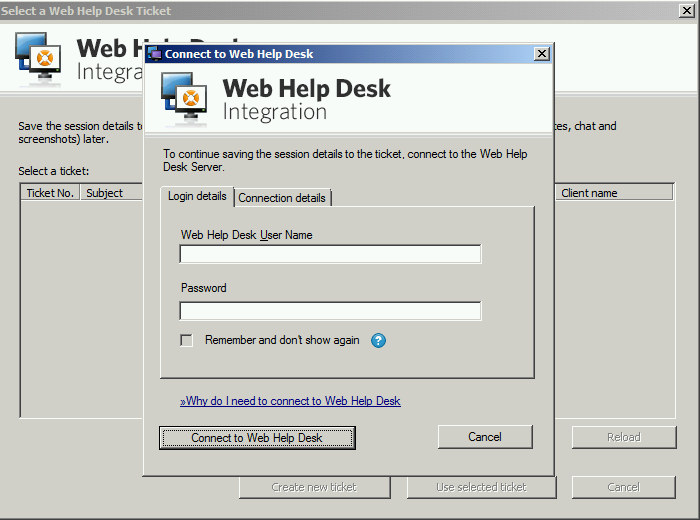 You can launch an MRC session in Web Help Desk from a client ticket or an asset. Each asset must have a valid IP address in Web Help Desk. If an asset does not have a valid IP address, you will not be able to establish a DameWare session. When you start DameWare MRC from Web Help Desk, it opens in Web Help Desk Integration mode, allowing you to save information you collect from a remote support session in MRC to a Web Help Desk ticket. 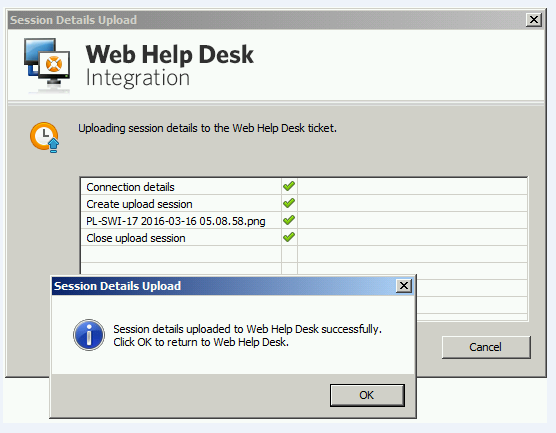 A banner appears during the session when MRC runs in Web Help Desk Integration mode. 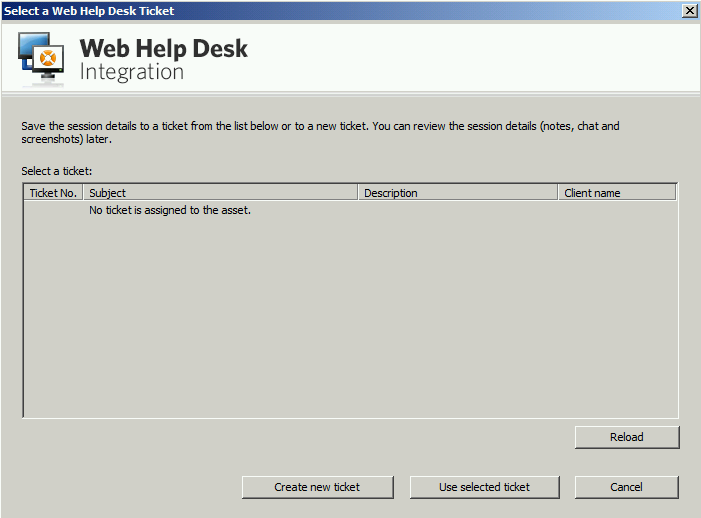 Click My Tickets to open an existing Web Help Desk ticket assigned to you. Click the Asset Info tab. In the Client Assets tab, click the number associated to the asset in the No. column. In the Ticket Assets tab, click the DameWare MRC icon connected to the asset. The DameWare Mini Remote Control (MRC) console displays, stating that you are running in Web Help Desk Integration mode. Troubleshoot the asset as needed. When completed, close your session. Locate the asset in the search results. Click the DameWare integration button next to the asset number. The DameWare Mini Remote Control console displays, stating that you are running in Web Help Desk Integration mode. When completed, close the session. Log in to Web Help Desk to save the DameWare troubleshooting information. Select the ticket and click Use selected ticket to save the session details to the Web Help Desk ticket listed on the screen. 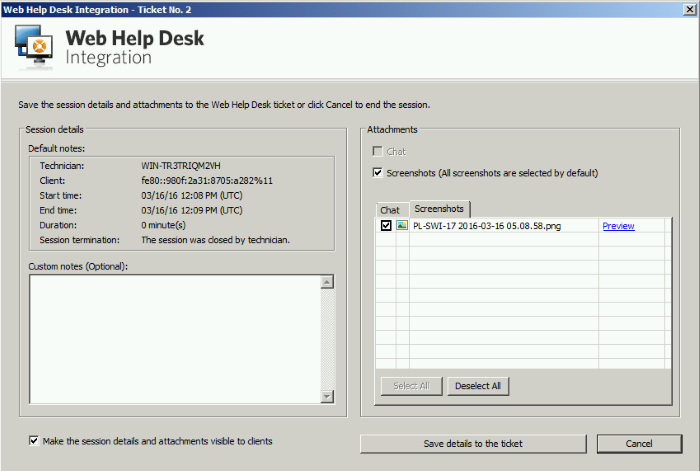 You must either have a ticket number or create a new ticket so the information can be saved to Web Help Desk. To save the session to a new ticket, click Create new ticket. Enter any information you or the client may want to refer to later about the troubleshooting session. To make this information available to clients, select Make the session details and attachments visible to clients. Click Save details to the ticket. The ticket updates are uploaded to the ticket. Click OK to return to Web Help Desk. The ticket updates or new ticket displays in your list of tickets. Chat sessions are saved in .RTF format. Screen shots are stored in .PNG format. Session details are incorporated into the note.